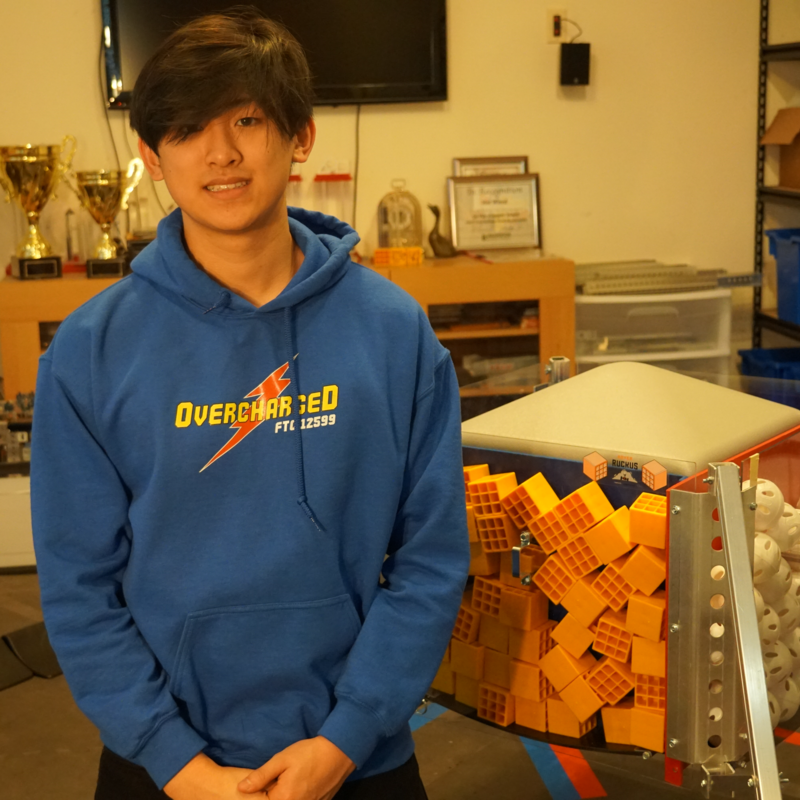 Last year, nearly everyone on our team was an engineer, with our captain focusing on the engineering notebook and branding while also designing the robot. Over the summer, we’ve noticed that the business aspects of FIRST played a massive role in the way our team functions as a whole. For the Rover Ruckus season, we decided to reinvent our team structure by implementing an interdisciplinary system for all the members. Each member chooses at least one aspect from both engineering and business that they plan to pursue for the rest of the year. With everyone understanding both engineering and business aspects of robotics, we will be able to create a strong robot with detailed documentation, both of which work with our branding strategy plan. What’s up! 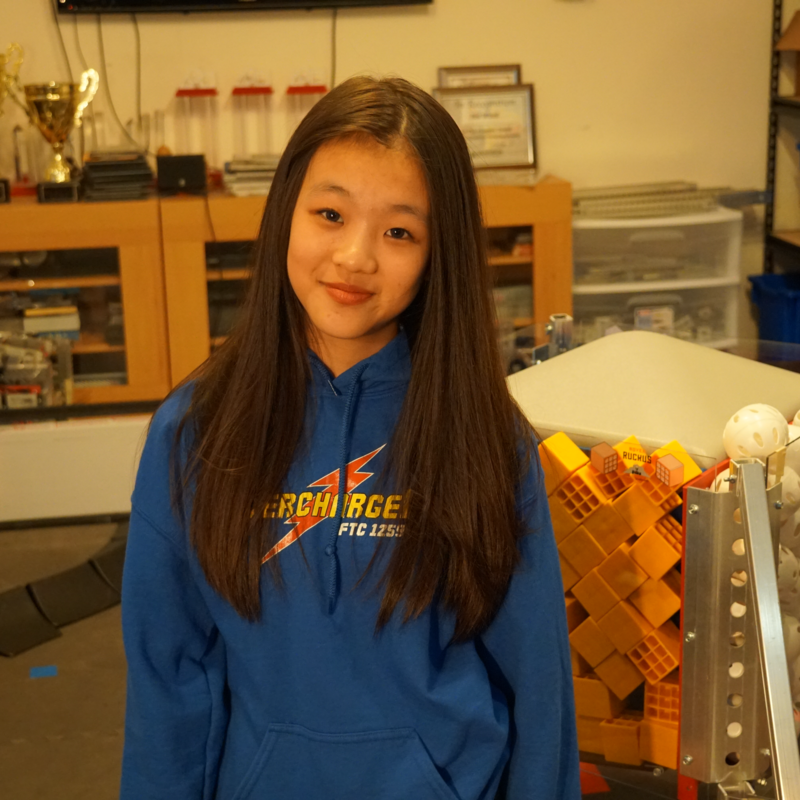 I’m Advaith, and I’m a senior from Westview High School who has done FTC for 6 years, the longest out of anyone in Spark Tech history. I’ve been the captain and driver coach of Overcharged since 2017 and was nominated as a Dean’s List Finalist during the Relic Recovery season. I was the only member from our world champion parent team, Hot Wired, to stay and help develop Overcharged for both of our years. On Hot Wired, I was a builder, scout, and main filmmaker. 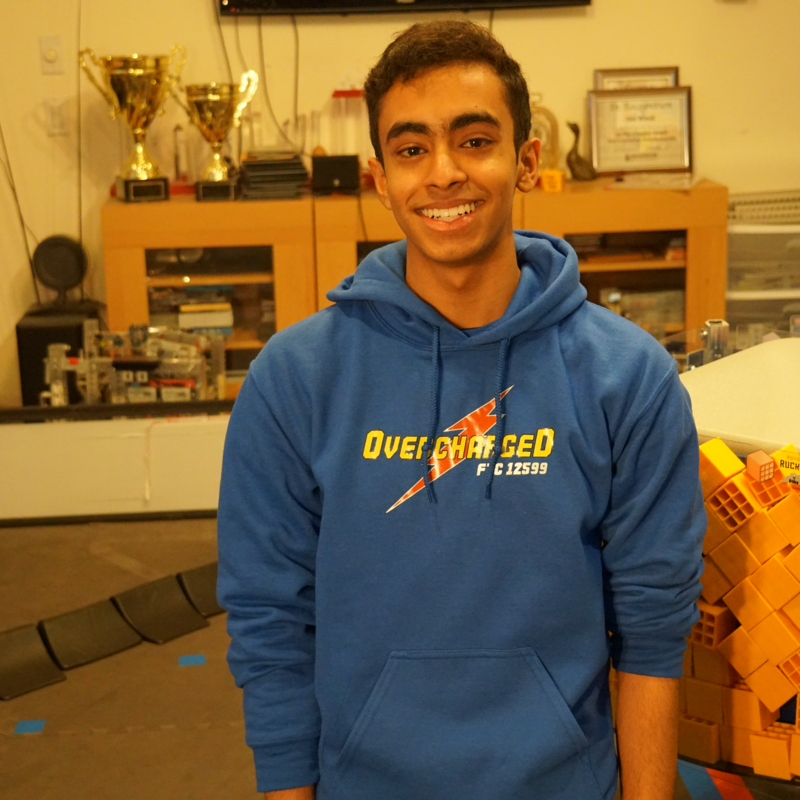 On Overcharged, I work on innovating certain components on our robot such as the swerve drive, and I also do a lot of the business aspects of FTC, including the Engineering Notebook. Outside of FTC, I’m an active participant in the DECA competition, which has helped me create an international-winning business called NeoFlow, which plans to digitize receipts (you can read more about it here). I’ve used my experiences from DECA to make Overcharged a more vibrant and successful team. Aside from the academic stuff, I’m a massive fan of the rapper Logic (shoutout to the RattPack) and I have a strange obsession with sneakers (specifically Jordan 4s). My favorite flavor of ice cream ranges from time to time – I enjoy mint chocolate chip if I’m getting it from the grocery store, but I love cotton candy if I’m visiting Cold Stone. If you want to learn more about some of my individual projects, you should check out my website. Hello! 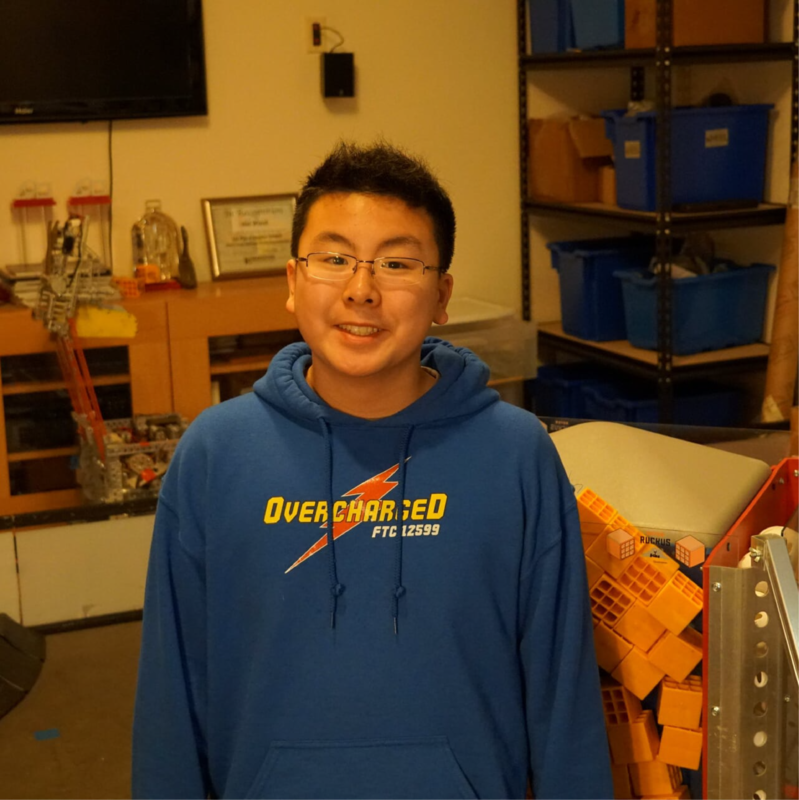 My name is Kevin Qiu and I’m currently a sophomore at Lincoln High School. 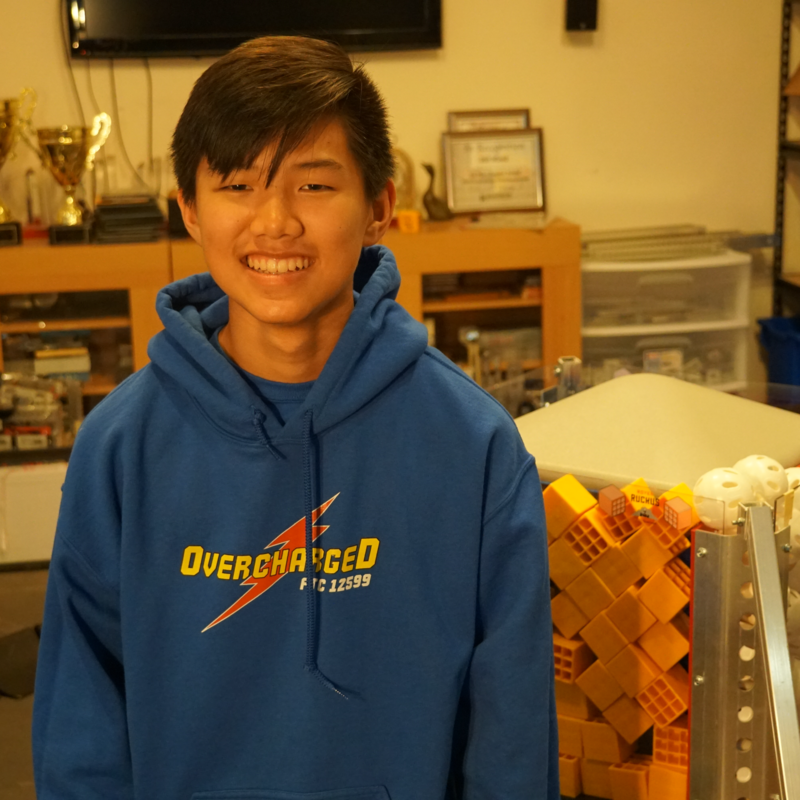 This is my second year of FTC, and I’ve been the lead programmer on Overcharged ever since I started. I also work on the robot sometimes, but mainly focus on the wiring and testing of new components. The business work I do for the team involves editing some engineering notebook entries. Besides robotics, I’m doing Science Bowl and am in a couple other STEM-related clubs at my school. I spend a lot of time just reading, but I also really enjoy programming in my free time. In the spring, I plan to do track and field, where I am a sprinter and do long jump. I’ve played piano for upwards of 7 years and am currently at level 9. My favorite type of ice cream is either pistachio or lavender, but green tea is pretty good too. Hi there! I’m Sophia, and I’m a freshman at Jesuit High School. This is my second year participating in FTC after spending my first season working with team Revamped. 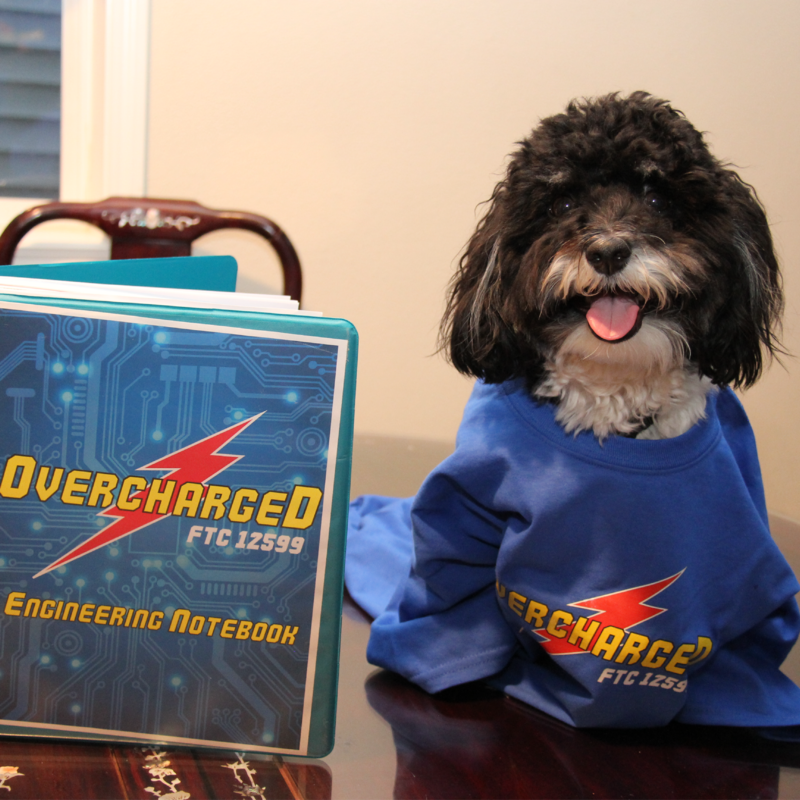 On Overcharged, I help manage our Engineering Notebook, which includes coordinating assignments and assisting others in writing their entries. As one of our 3D CAD members, I help create comprehensive 3D models that document our mechanical systems and allow us to simulate various parts digitally. 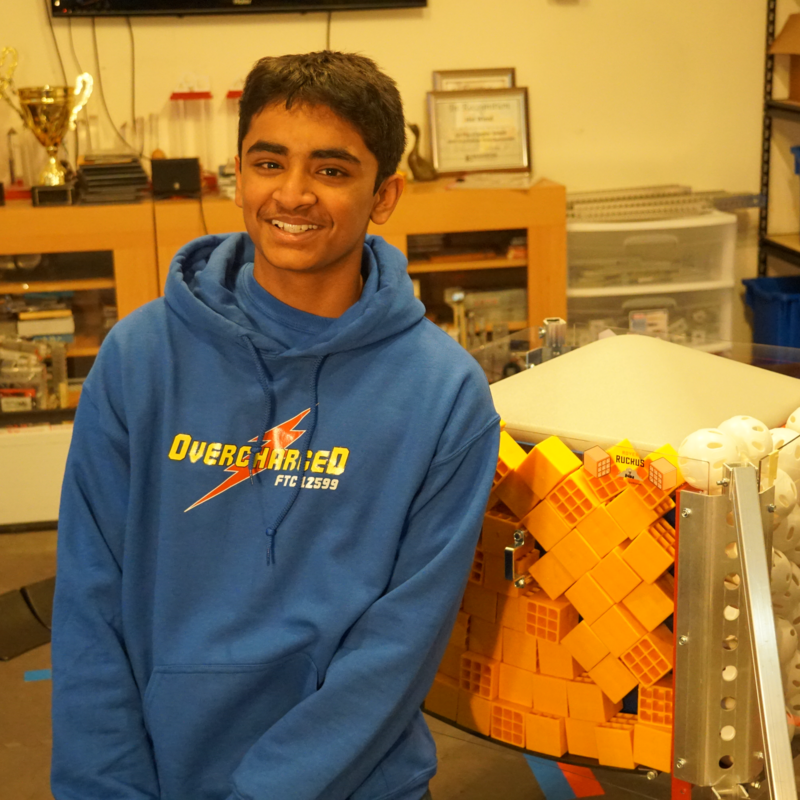 Outside of FTC, I have also competed in various other science and mathematics competitions, including Science Olympiad and Mathcounts, both of which I captained during my time on those teams. My interest in both STEM and journalism led me to become a writer for my community’s local magazine and fueled the creation of a science and humor blog my friend and I write. My experience in these two distinct fields has helped me merge STEM with journalism during my time in FTC, whether it be writing an Engineering Notebook entry or looking for a new outreach. During my free time, I enjoy figure skating, playing the piano, memorizing digits of pi (with my last name, it’s basically a familial obligation), and drawing stick figures (which is an extremely sophisticated form of art). My favorite flavor of ice cream is currently caramel turtle pecan, though marionberry ice cream is a close runner-up. Hello there! 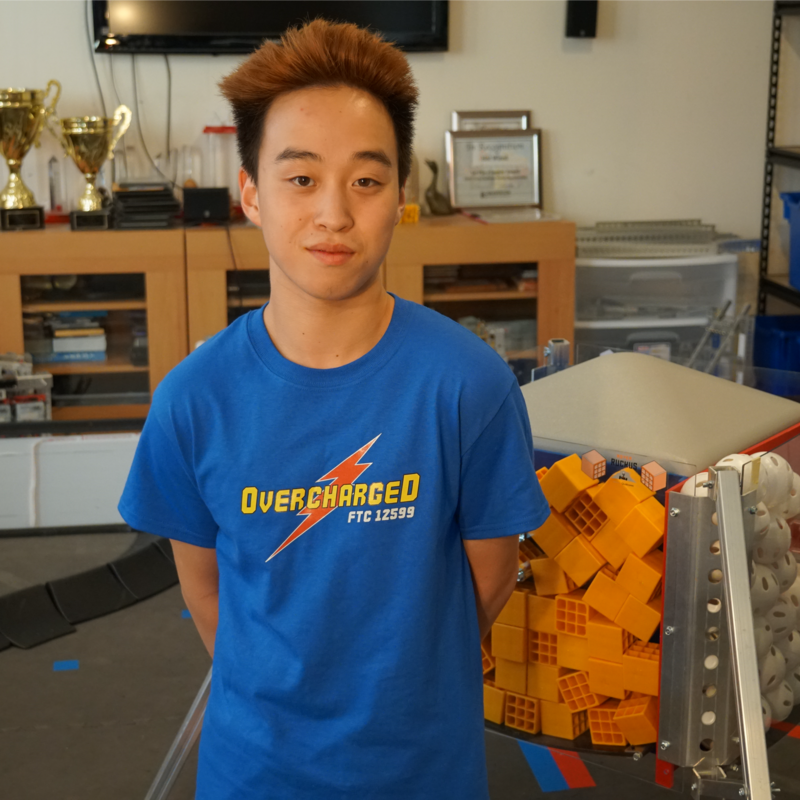 I’m Arnold and I am a new rookie member on the Overcharged team. I work mainly on building and milling, but do help on engineering notebook and CAD. I have also done some 3D prints for the team marker and our Micro USB strain relief design. I was captain of the FLL team the Master Builders for 3 years. 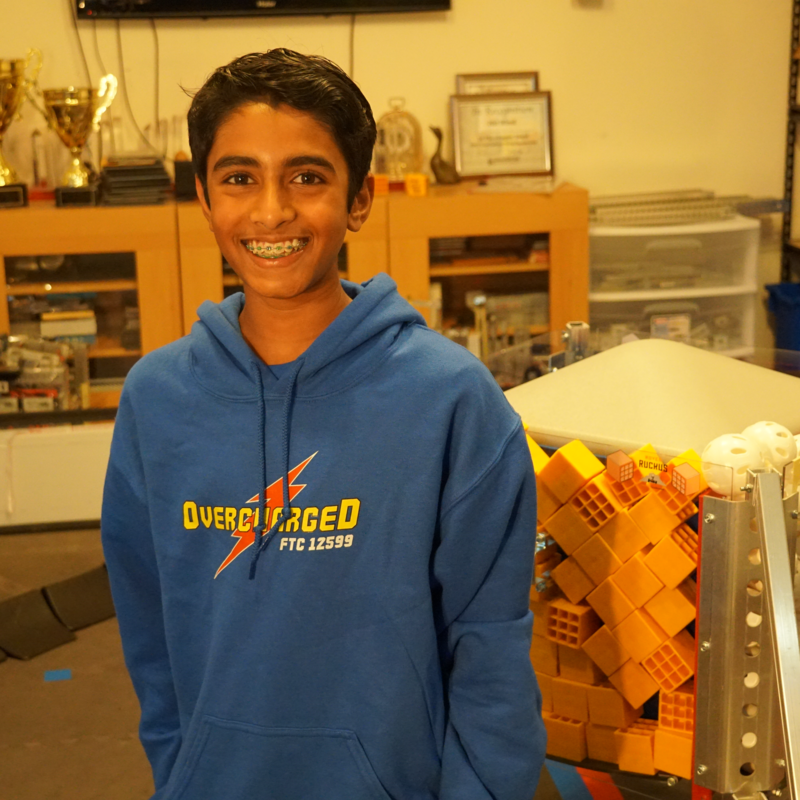 I am also a mentor for my little brother’s FLL team Orbiters. Outside of FIRST I like to play chess a lot as it is a fun and complex game and I also teach chess at Goodtimes Chinese School. During my free time I like to build with legos, nerf with my little brother, read and also play soccer. My favorite dessert is mango sorbet. Hey guys, I’m Vikram. I’m 14 years old and in 9th grade at Westview high school. 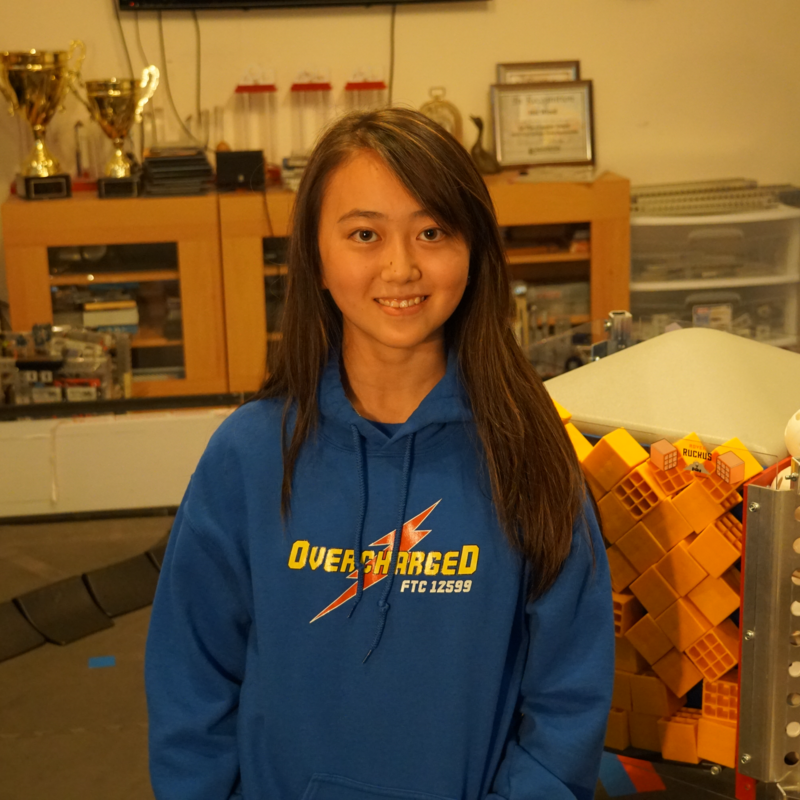 This is my second year in FTC but my first year in overcharged. I do building, CAD, and driving for the team. Outside of FTC I have many hobbies. My most favorite is to go to the gym and next comes gaming. When I have the free time I like to hang out with my friends. I have been competing in the Sikh youth symposium for more than 5 years and I won first place in state level a few times. I also have been doing Taekwondo for 4-5 years and recently became a black belt. I recently joined the speech and debate team in Westview High School, and I plan on using those skills in the future. I don’t know about you but I recently started to love bubble tea especially Thai tea with popping boba. My favorite type of ice cream is Cinnamon but mint chocolate ice cream is very close. Hi! I’m Fiona and I’m a 7th grader at Stoller Middle School. This is my first year participating in FTC although I do have previous experiences in FIRST. This is my first year participating in FTC although I do have prior experiences in FIRST. In previous years, I participated in FLL where we placed first in the qualifying match which let us compete on a higher platform. 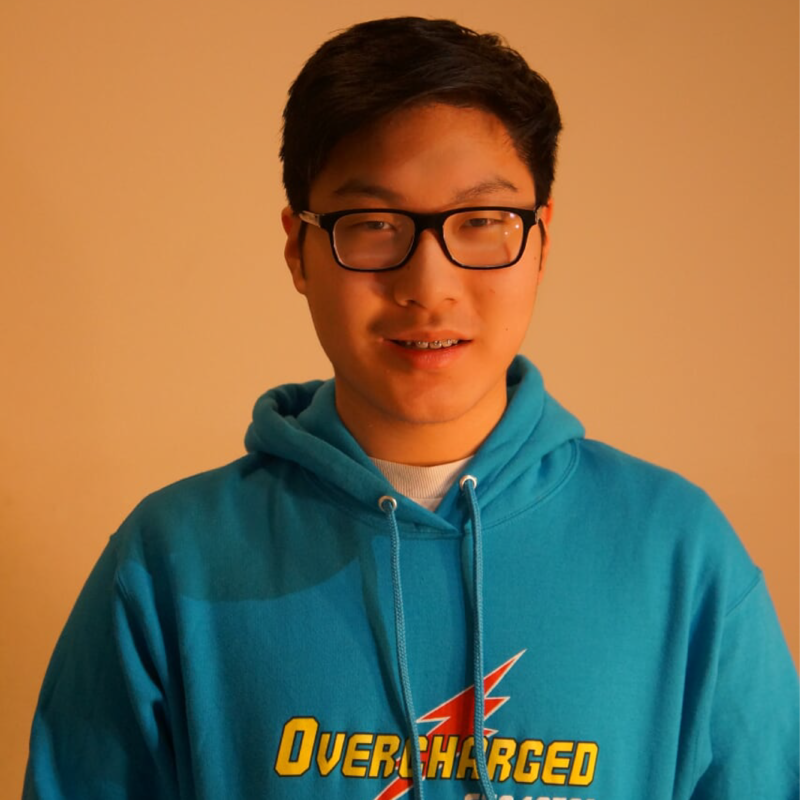 In Overcharged my main role is to help CAD designs and prototypes as well as help out with scouting during competitions. Of course, we aren’t always at competitions so during the season I also help out with writing and editing the engineering notebook. And as a rookie, another important role of mine is to learn as much as I can so I can help with more advanced things later on. Outside of FTC, one of my main hobbies is art. I regularly compete in art competitions and have placed in a grand total of 7 competitions over the span of 3 years. My artistic talent can be found useful in FTC when designing, and it can also play an important role for general team success. Some of my other interests include dancing, playing the piano, reading, and being socially awkward. And if anyone is curious, my favorite ice-cream flavor is either mint chocolate chip or Marionberry pie. Hi, my name is Max Shi. I’m a freshman at Sunset High School. 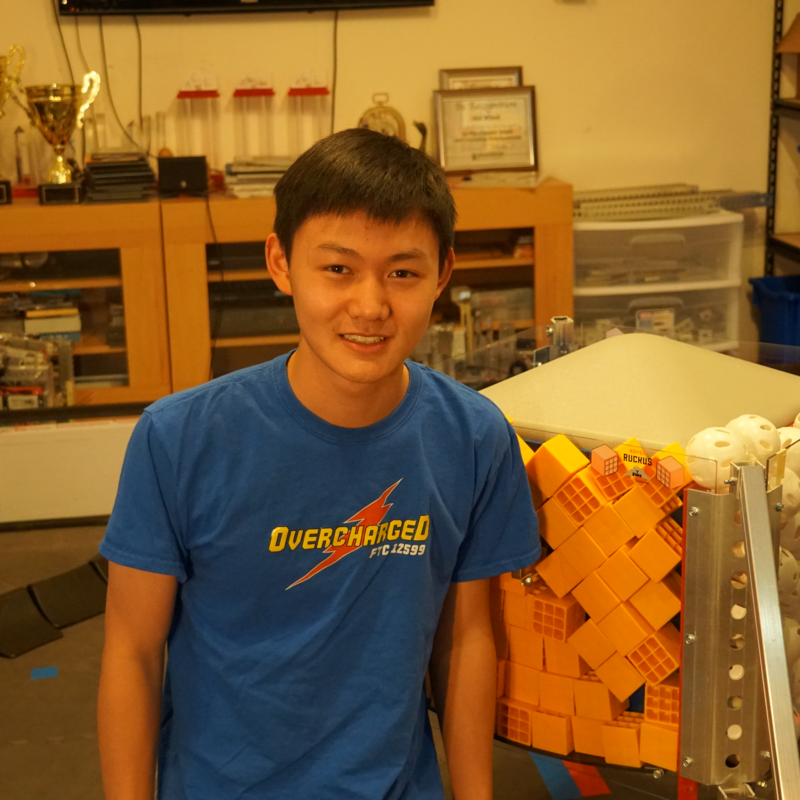 On the team, I’m mainly responsible for using CAD to create 3D models of the robot. I also scout teams at tournaments and help to decide which teams to select as alliance partners based on their performance. I contribute to building the robot and work on the engineering notebook as well. Outside of the team, I play tennis, am in the Boy Scouts, and am involved with clubs at school. Some of the clubs I am involved in are speech and debate, Model United Nations and key club. I also like to snowboard at Mt. Hood and other ski resorts. I also like ice cream it is very yummy. I think my favorite ice cream flavor would be mango but I also like many other flavors! 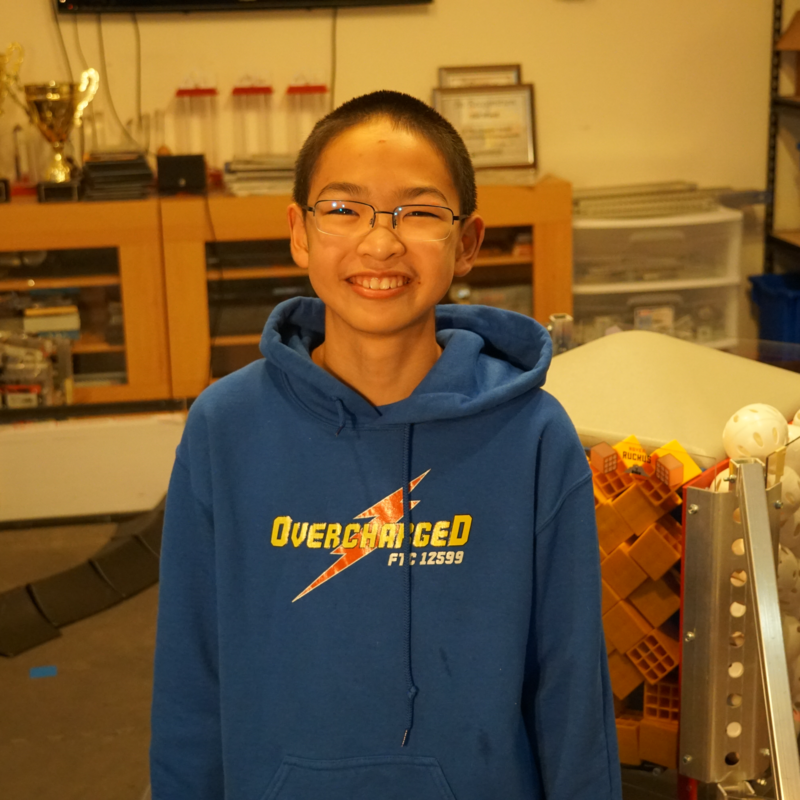 Hey guys, I’m Alan Ma and I joined Overcharged this season as a rookie to the concept of FTC. I have 3 years of FLL experience and 3 years of Junior FLL experience through the years. I focus on CAD design, engineering notebook, outreach organization, and scouting. 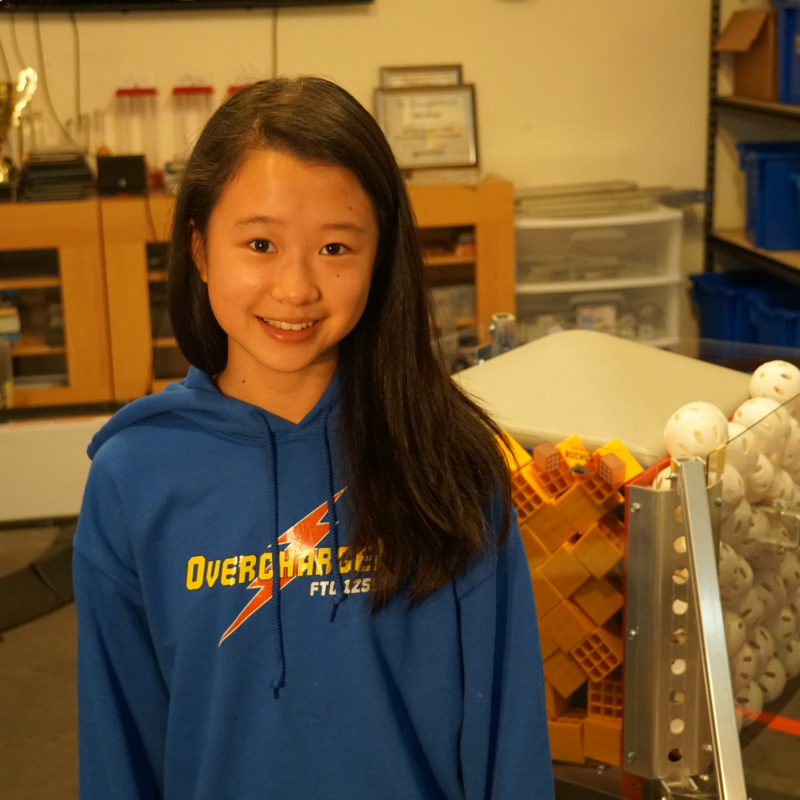 Outside of FTC, I enjoy competitively playing tennis and competing in math/science fair. You may have seen me in Broadcom MASTERS, MATHCOUNTS, ARML, ACSL, and NWSE. I simply enjoy the thrill of being in a fast-paced environment and using orating skills. I’ve used my experiences in competitions to help do calculations and ability to speak to add to the broad spectrum of people on Overcharged. My favorite flavor of ice cream is red bean and green tea, but when it isn’t available, I like Tillamook Marionberry Pie. Hi guys, I’m Victoria. I’m 12 years old and am in seventh grade at Lake Oswego Junior High School. I’ve been on this team for a very short 4 months. My goal for this year is to be a very helpful team member and to know a bit of everything. On Overcharged, I mostly complete grant applications for our team’s funding, actively search for outreach opportunities, and help with some basic building components such as milling, drilling, etc. During competitions, I plan to help with some maintenance, electrical, and scouting. Some things I like to do in my very limited free time is art (I’m currently doing 2 point perspective), fencing, speech and debate, and reading. I also enjoy baking things, especially cupcakes, and lastly – the best thing ever is just watching Netflix in bed with a bucket of popcorn on a rainy day (no one can judge me). My favorite flavor of ice cream is and will always be vanilla. Hi! My name is Rohan, and I’m a current 8th grader St. Pius X School. Including this year, I have been part of FIRST for 6 years. During my 3rd year in FLL, my team, Gears in Motion #96, made it to the International Invitational in Arkansas and competed against other teams from different countries and states. In Overcharged, my role is designing some components and app-based scouting at tournaments. Outside of Robotics, I am a competitive tennis player. Last year, I was ranked #1 in Boys 12 intermediate in the Pacific Northwest in tennis and am actively pursuing the Advanced ranking in Boys 14. In addition to tennis, I am also a first class Boy Scout working towards my Star ranking. My favorite genre of music is classical and my favorite ice cream would be mint and caramel. Hey, I’m Jason. I’m an 11th grader at Sunset High School and this is my second year on Overcharged. I’ve been really enjoying it so far; especially seeing how our team has changed and improved so much in such a short time. I’m really proud of where we are headed. On Overcharged, I do a lot of fabrication and assembly of parts. The other aspect that I love is presenting and showing off our team to others – both to judges and at outreach events. 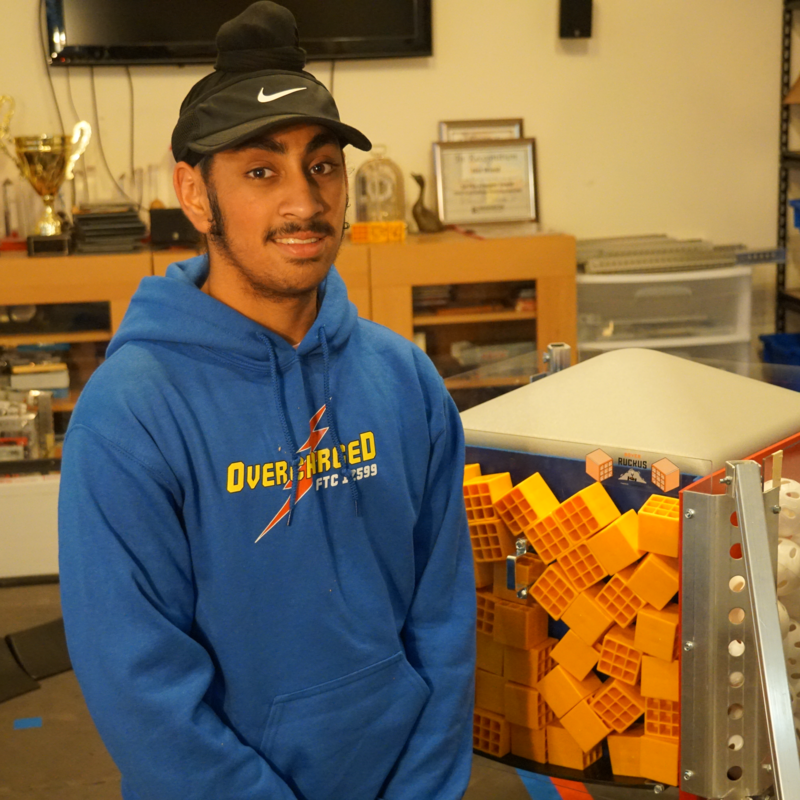 Spreading FIRST and a passion for robotics is important to me, and whenever the opportunity presents itself I do my best to. Outreach also falls in line with my other primary interest: debate. Engaging in critical thinking and learning about a bunch of topic areas is really educational and helpful, not to mention fun and competitive. My favorite flavor of ice cream is probably matcha – tea is one of my favorite things ever and if there were more tea ice creams I would definitely try them all! Hey there. I’m Robin and I’m a freshman attending the University of Pennsylvania’s Jerome Fisher Management and Technology Program. I’m interested in Computer Science and Environmental Management. I was the co-captain of Hot Wired during our last year and worked a lot on building. My most notable build has to be the Res-Q latching system, which I’ve heard that we’ve been able to repurpose for the Robot in 30 Hours Challenge. On Overcharged, I was notable for creating the first idea for the intake system, consisting of wheels that would intake the glyphs and outtake from the front. I also helped a bit with scouting throughout the season. My favorite genre of music really depends on what’s popular. My favorite ice cream flavor is chocolate. Hello! I’m Kulfi! If you watched our Robot in 30 Hours stream, I was on the camera – twice! I play a huge role in the team as the Team Motivator. Whenever we have stressful Engineering Notebook meetings, I’m always ready to play with our other members. Sometimes, I even try to play on the PS4 with the rest of the members after the meetings too. Outside of FTC, I enjoy being a one-year-old Havanese dog. My favorite toy is this one Tiger toy that I drag around and play with every day. I barely know how to catch a ball but I like the blocks and balls from Rover Ruckus. My owners on the team are Advaith and Parthiv, and I find it awesome whenever they take me on walks. My favorite flavor ice cream is Mango Kulfi. For those of you who don’t know, Kulfi is a type of Indian ice cream, and I actually love it! Actually, anything that’s edible I love – food is my favorite.